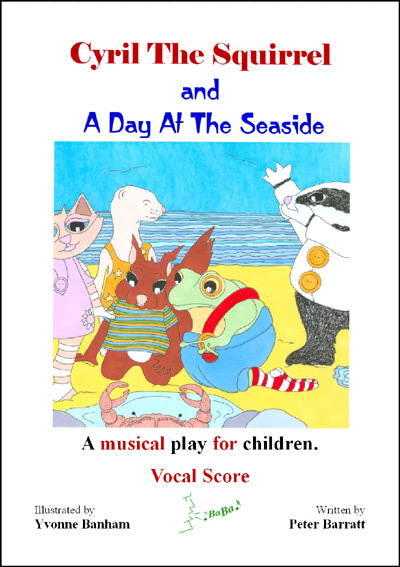 This is the story of Cyril The Squirrel And A Day At The Seaside, but in play form with music, which comprises 4 songs for children up to about 8 years of age to sing in unison. The chorus can be of any number. There are 7 roles for individuals which should help in the development of children. A Narrator, who could be a confident child or an adult, and a Pianist of reasonable ability are also required. The books are available as Libretto (£5) and Vocal Score (£7) or a pack, suitable for a production of the Singthing, of Libretti (7) and Vocal Scores (2), plus one copy of song words that may be photocopied (total charge £39). Additional copies of the Libretto and Vocal Score may be acquired at a similar rate of discount.